Home // Wilderness Resort Blog // WHAT HAPPENS WHEN YOU INTEGRATE A GAME WITH A WATERSLIDE? IT’S SLIDEBOARDING — The future of waterslides, Now open! We’re super excited to announce that we have converted two of our existing tube slides in the Klondike Kavern Indoor Waterpark into state-of-the-art, interactive Slideboarding systems. The Claim Jumper Challenge offers a real life gaming experience within a waterslide. The slideboards resemble surfboards with handles that riders sit on. On each of the handles, there are two colored buttons that serve as the game’s controllers. As riders adventure down the waterslide, they encounter a series of flashing red, yellow, green and blue lights. The goal is to press the colored button on your slideboard that corresponds with the colored light that is lit at the exact time your board passes under it. If it is done at the correct time a rider will get the maximum amount of points and the handles of your board will vibrate to alert the rider of their bullseye accuracy. A leaderboard in the waterpark will let guests see how they did and where they rank against other riders. As riders get better at Slideboarding, new and challenging levels will be unlocked. 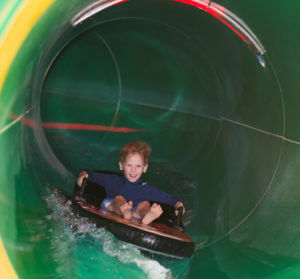 The Slideboarding system is the creation of WhiteWater, the original waterpark and attractions company. Industry experts are saying it is revolutionizing the waterslide industry by combining it with a smart gaming system that knows who you are and tracks your progress and scores through your run down the waterslide. There are currently only four Slideboard systems in the country in Las Vegas, the Poconos, Williamsburg, and Denver. It is designed to appeal to a wide variety of guests, from thrill seekers and gamers to moms and grandparents, offering excitement without being risky or feeling physically challenging. “It’s not just about the thrill but the skill,” says Brandon. The installation of the specialized LED lighting and other equipment for these slides will begin in September and the rides will open on December 18, 2015. Klondike Kavern will remain open on the weekends throughout the construction process. However, all of the tube and body slides on the tower where the Slideboarding will be located are going to be closed during construction. The Hurricane thrill slide will remain open, as will the lazy river and the interactive play structure in the middle of the park.